I am SO excited about this Woo Hoo!! Wednesday. My friend, Gorgy called me last Saturday just to tell me that I inspired her :) well, Fizzy Party inspired her. Woo Hoo!! She was in charge of decorating for a bachelorette party. All the girls were meeting at a hotel and then heading out on the town. She told me in detail everything she did and I was SO proud! Little details can make all the difference. Gorgy took a page from Fizzy Party and hit up Dollar Tree. Her basket was filled with a black table cloth, chocolate truffle candles, champagne glasses and cheetah stone coasters. Boring by themselves, until she fizzy'd them up. She also hit up Michael's, looking for sales and using a coupon. Woo Hoo!! The chocolate truffle candles get fizzy' d up with bows and some bling. They look so much more expensive now. The cheetah coasters look almost like lingerie with their bows, bling and marabou. Gorgy said she used left over ribbon she had, bling stickers and the labels are ones she had around the house. She used a design edged scissors to add detail. Those plain champagne glasses got some ribbon and marabou to make them look way more expensive. Like me, Gorgy's light bulb went off while she was prepping all this. Tissue paper in the glasses for POP! Love it!! 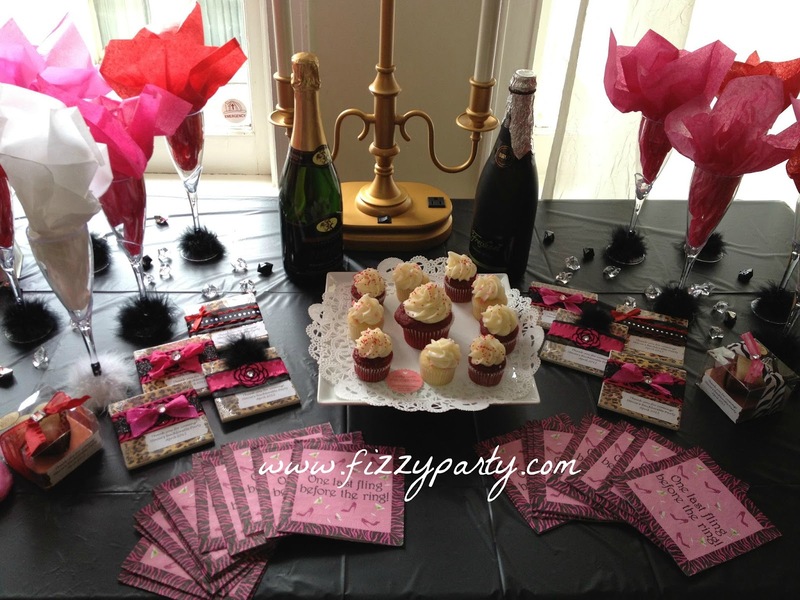 Has Fizzy Party inspired you? Post it on my Facebook page or email me with details of your party and I'll feature it here on Woo Hoo!! Wednesday. Thanks Tiffany! I had a great time doing this for a fabulous bride to be! The wedding is this weekend! Looking forward to it and honored to be the maid of honor!